2009 February — Dayna Macy, author of "Ravenous"
My most recent piece for Yoga Journal is hitting newsstands now. Titled “Shelter from the Storm,” the piece interviews six renowned yoga teachers on how to maintain balance during these economically troubled times. Advice ranges from sitting and observing yourself when fear arises, grounding the legs in asana practice to give yourself stability, and more. I’m glad I wrote the piece, because now I need to try to live it. 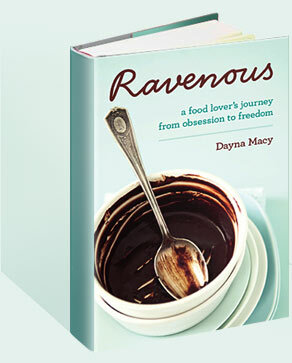 I’m in the midst of selling my book, “Ravenous”, a food and eating memoir. I have a wonderful, tenacious agent, and I’ve gotten strong and positive early feedback. But, and there’s always a but, one editor I really wanted to work with, who loves the book, presented it to her publisher, who didn’t get it. Another company dropped out of bidding because she thought it would be “too competitive” and they wouldn’t be able to bid high enough. Yet, another editor loves it and is trying to shepherd the book through the powers that be to get a yes. And, there are at least six other publishers in the mix. All this is good, right? This is my first book, editors are responding to it positively, my agent deeply believes it will find the right home, and yet… I’m a bucket of nerves. I’m so anxious that I got shingles, again, for the third time in my life. Shingles, in fact, seem to mark my major life events — I got it when I graduated college, when my boys were young, and now that I’m selling a book. It’s easy to write about practicing non attachment, but at times like these, it’s much harder to live it. I have put my all into this book, my stories, my efforts, my sweat, and I think it’s really a pretty good book, so far (I’ve written three out of 18 chapters). Dare I say, I’m even achieving, at moments anyway, a lyricism in my writing, where sentences occasionally sound like music. So it feels like it’s me out there in the universe, not a thing, but my very soul. I feel pretty naked, actually. Time to go for a walk. Time to get back to the mat. And time will tell me where Ravenous will land. In the meantime, I hope my shingles go away soon. I recently had a perfect day. I spent a few days with my family in Mexico, at the Hacienda San Antonio, about 25 minutes from Colima. We took a picnic at the base of Volcano de Fuego. The kind people at the Hacienda created an almost movie-like tableau for us — a rough hewn table on a kilim rug, table set with blue glassware and festive linens. They grilled meat, chicken, and corn, served us gazpacho and polenta orange cake. And whenever my margarita was empty, a wonderful man named Sergio refilled it with Tequila made from local agave plants. I could swear he was trying to get me soused. The picnic was in a giant meadow. The sky was perfectly blue, the breeze warm. We saw a rattlesnake, a bull (all far enough away from us), cows, and hawks. After lunch, we rested on a carpet they had placed nearby, with giant stuffed white linen pillows. The boys batted at a pinata, finally breaking it (there was a clay pot inside that made it hard), stuffing their mouths with endless pieces of candy. We were all completely happy.